Part dirt road alternative touring route between Uluru and Alice Springs that takes in Kings Canyon, (well worth a look), and the West MacDonnell National Park, (ditto). Heads off through plenty of scenic territory and joins the dots between many of the Centre’s best features. It’s short but a bit of a slog. And you are touring with the tourists once you hit the National Park. Kings Canyon to Alice Springs via Namatjira Drive. Hema Great Desert Tracks of Australia North Central sheet is reasonably detailed. allow 5 days riding with another day off to climb Mt Sonder. 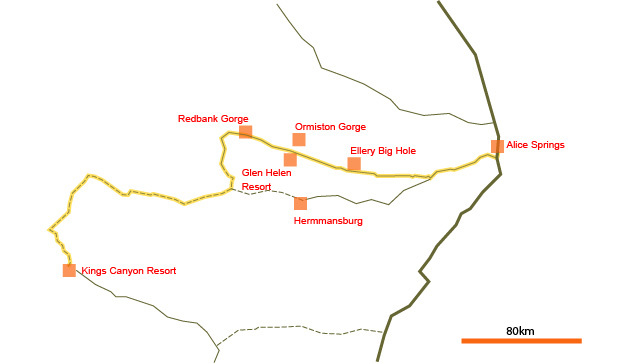 Mereenie Loop & West MacDonnell route in yellow. Permanent water points shown. The seal finishes a few kilometres out of Kings Canyon and begins again at the Namatjira Road intersection about 154km down the track. The dirt road is often soft and slow with the occasional 200m stretch of sand and, as you head towards Hermannsburg, kilometres of bone jolting, filling loosening, cobblestones. Ugg. Just when you get to the seal and breathe some relief there’s another 7km unsealed section with a stretch of more sand when crossing a dry watercourse. Then when it’s time to start swearing again it’s all over and a hill climb up to Tyler’s Pass gives you a different reason to sweat. The view of Grosse’s Bluff at the top of the pass makes it all worthwhile. And then the nice 30km of downhill to Redbank. From there it’s undulating all the way to Alice Springs on a good sealed road but with plenty of tourist traffic. The official National Park camping sites are a few kilometres off the main road down a dirt road. This needs planning. There’s no water points between Kings Canyon and Redbank Gorge. At 210km with most over a fairly slow, tough road that’s two nights out with 3 days riding. You need the capacity to take about 25 litres to be self sufficient, (man, that’s another 25kg). But at least there’s a fair amount of tourist traffic and the off road campers usually carry a spare 100 litres or so if you want to flag someone down. Once you hit the West MacDonnell National Park there’s rain water tanks at the National Park camping spots: Redbank, Ormiston Gorge, Glen Helen Resort, Serpentine, Ellery Big Hole and Stanley Chasm. Town supply in Alice. This is also an issue. Coles and Woolworths supermarkets with nation wide pricing in Alice Springs but that might be at the end of the ride not the beginning. There are no IGA supermarkets, community stores or roadhouses along the way. The best you can do are the reasonably well stocked resort stores at Uluru or Kings Canyon. Resort? Yup, they are pricey. There are expensive takeaways at the Glen Helen Resort and Stanley Chasm. Otherwise you are out of luck. Paid campsite at King’s Canyon Resort, $16 per person (2009). Bush camping for a couple of nights until reaching Redbank Gorge, ($3 pp), which is in the West MacDonnell National Park. Stay at the rocky campsite on the ridge, rather than the bushland one, to get you away from the worst of the night time generators and take in the view of the sunset. Ormiston Gorge campsite is more touristy, it’s at the biggest attraction in the park. Ellery Big Hole is great, even if the water can be chilly. All these national park campsites have water, toilets, gas barbecues sometimes, at a reasonable cost of $3pp and there’s plenty of company in rented cars doing their week long fly in package tour from the main cities. Glen Helen Resort has much more expensive camping if you prefer close proximity of your fellow travellers. In Alice Springs there’s quite a number of caravan parks and two backpackers to choose from. Annie’s Place is good value at $18 pp including brekkie and Mulga who runs the place is a decent character. Sometimes a bed is really appreciated. The road in to Grosse’s Bluff is 4WD but it really takes a climb up the sides of the hill to appreciate the scenery. Climb Mt Sonder from Redbank Gorge for a 360º view of the picturesque MacDonnell Range, it’s 9km each way but the signage stating 8hr time should be allowed is way off the mark. With fit legs 2 hours up and 1.5 down is more like it. Can be cold on the top if windy. A few days could be spent exploring all the gorges. Highlights, other than Mt Sonder, would have to be Ormiston Gorge, Ellery Big Hole for sunset and sunrise, and the short Stanley Chasm. This road is supposed to require an easy to obtain $2 permit to traverse aboriginal land but it’s not clear exactly who might patrol the road insisting on seeing it. Available at the resort check in or information centre in Alice. You are up above 850m here so it can get cold at night in winter. Ain’t so many who have written about this particular route but my first blog from my own travels starts here: a bushcamp on Mereenie Loop Rd: with 2 new biking companions. If that’s not enough I did it a second time starting here: Watarrka National Park Boundary: hey, that’s an old familiar campsite. These 286 images give a general impression of the road conditions you are likely to encounter out there. And just a few pretty pictures too.